The saying goes "a picture is worth a thousand words." Well, how about you put your own random phrase to a picture and laugh your head off? What Do You Meme is a silly game where players will match up funny phrases to the most random and downright hilarious pictures. If you can win the heart of the rotating judge, you’ll get the points. What Do You Meme is a great party game for large groups up to 20. The more people the crazier it gets. Who knew a simple picture could have so many different meanings? Learning how to play is similar to other games out there (Apples to Apples). Pick this game up and bring What Do You Meme to your next party. The one with the most cash at the end of the game is declared the winner! 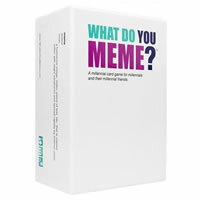 This game comes with 435 cards and the official What Do You Meme game rules and instructions. Please keep in mind that the official What Do You Meme party rules and instructions could be different depending on the game version you have. The rules below are some of the exact directions on how to play What Do You Meme. Share with us your comments, funny stories, tips, advice, strategies, creative ways to play, questions about how to play, problems with the rules or anything you want about What Do You Meme. All submissions will be reviewed within 24 hours. Click here to add your What Do You Meme comments.